If your children love soft toys (Maxx is a huge fan) then consider buying them one of the lovely fairy tale inspired teddies from Ikea this Christmas. Not only will you get a soft toy but for every soft toy and children’s book sold between the 20th of October 2013 and the 4th of January 2014 Ikea will donate one euro to education programmes worldwide supported by UNICEF and Save the Children. 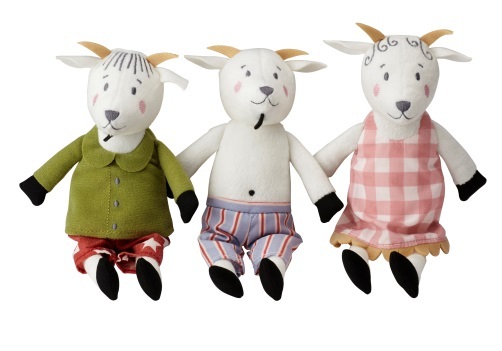 This year Ikea’s soft toy range takes inspiration from children’s fairy tales. The range features the wolf and grandma, Dragons, fairies, billy goats and unicorns. 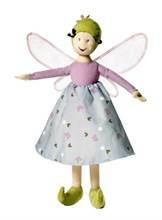 The soft toy range includes; hobby horses, finger puppet sets, glove puppets and the normal soft toys. The soft toys are all well designed, colourful and some even have special features. Take Mr Wolf and Grandma pictured above for example. You might think Mr Wolf is innocently cuddling Grandma but he is in fact getting ready to gobble her up. Open up Mr Wolfs mouth and you can put Grandma in his mouth, then push her down and she will land in his stomach! Don’t worry though she’d not gone forever, open up Mr Wolfs velcro stomach and out pops Grandma as sprightly as ever! Hurrah! Maxx was sent Mr Wolf and Grandma and at first we didn’t realise anything happened and in fact thought Mr Wolfs stomach was a secret hiding place which was very cool in itself! It was clever Grandma (no not teddy Grandma) who figured it out much to everyone’s amusement, Maxx absolutely loves the teddy and laughs every time Mr Wolf gobbles up Grandma. 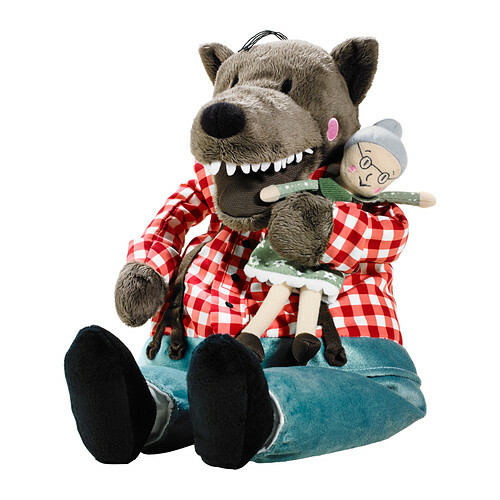 Mr Wolf and Grandma are priced at £8 which is very reasonable for a soft toy with a fun feature. I can see this being a favourite with Children this Christmas and being the source of lots of giggling. All of the toys are very reasonably priced with some smaller soft toys starting at 40p each and whether you buy a teddy for 39p or £5 Ikea will donate 1 euro for each soft toy sold. Since the campaign started in 2003 a staggering €47.5 million has been raised. The money raised has helped to improve the lives of more than 10 million children in 46 countries – amazing!